Personal pet project again here. 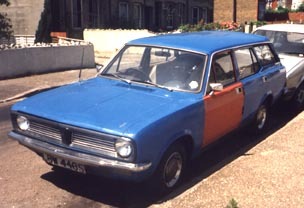 My father bought a series 2 1300 estate new in 1978 and it eventually ended up in our hands when my brother was going to scrap it when moving house. A bottle of Jack Daniels changed hands and it ended up with us. Although under 10 years old it needed restoring already and after new sills and a lot of filler in the wings (not to mention the baked bean tin fibre glassed in to hold up the headlight) it was back on the road. We went all over the place in it and loved it and it was a great shame when it had to go a few years later to make way for our Herald 13/60 convertable. Can't fit a motorbike in the back of a Herald.Mind you, you can get a Marina convertable, its called an MGB. LBW 448S at its scruffiest with black hammerite painted series 1 grill and bright orange passenger door. We got stopped by the Police a lot when it looked like this and quickly got a coat of Pageant blue on the door. Hammerited grill I liked though and the standard grill (which was perfectly OK, I just prefered the look of the older one) only went back on just before we sold it.Series 1 Super wheel trims also non standard and I've still got a set in the garage! This started life as one of my 1300 saloon shells plus part of the roof off a second one. A long way to go yet but the basic shape is nearly there. The tops of the rear doors needed squaring off and the body fluting straightening up (it slopes downwards on the saloon). Tailgate will be made seperately for convenience but will probably not come as a seperate part on the finished body kit.There was never a 1300 in series 1 only an 1800 so the 1300 grill will be ground out and replaced with an 1800 one. Although our car was a series 2, and indeed sported a series 1 1300 grill for quite a while (see photo) I'm doing this as a series 1 1800 for now and will probably take a mold of it before the 1300 grill is removed to make our car in its scruffy period. Once the 1800 is made this will form the basis of it when standard. I'm doing lots of things at the moment but provisionaly I'd say it should be finished by this Autumn (2004). It should fit on the same Datsun/XR3 size chassis as the normal Marinas.